Foro Umberto I, also known as the Foro Italico, is Palermo's seafront. It runs by the sea for over 2 Km, from Felice gate to Bagheria. 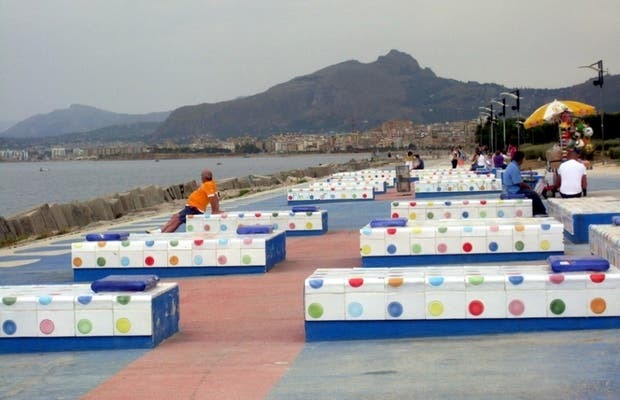 The walk was remodeled in 2000 and is 40,000 m2, you can find ceramic benches, walking paths, parks and bike paths. It's very colorful, the sidewalks are colorful and access is marked by two tall golden totems that are 2 meters high. Along the route there are sculptures with themes of Mediterranean flora and fauna and 1,400 brightly colored small ceramic figures.